Christmas is the annual festival in the United States and celebrated with lots of joy and happiness. Christmas is a great time for organizing get together and creates some great memories. Friends and relatives visit each other home and have a variety of food with wine and enjoy the party in the house. Stains are obvious when there is a party or you have pets or toddlers in the home. Red wine stains are one of the toughest stains to deal with and this stains usually occurs when you have hosted a party at your place. I am sure many of you have been in the same situation. 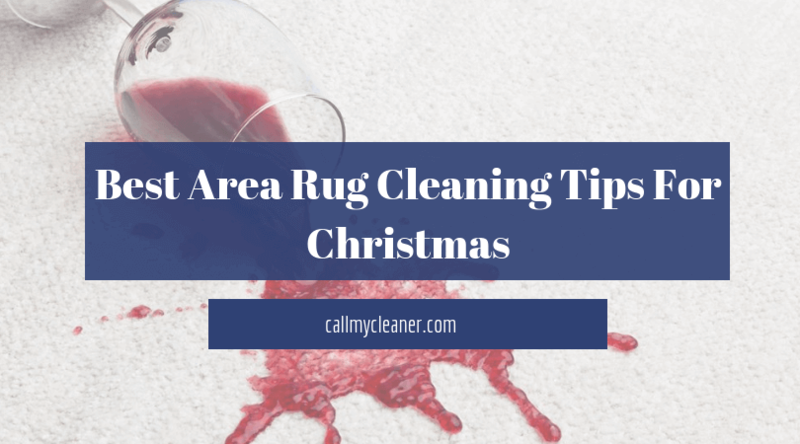 So, here we come with some best area rug cleaning tips for Christmas because anyone can need this. Do you know Everyone Needs Area Rug Cleaning Tips? In fact, even I have been in a similar unfortunate situation at my house last Christmas. Where a close friend of mine spilled a full glass of red wine all over my custom-made rug. I had to pay a huge amount at the time of purchase as it was a custom-made rug and I brought it just before the Christmas eve. A huge spill patch of red wine was made on the rug and I’m not able to say anything to my friend. Anyways, I saw the wine spillage happen almost as it if were in slow motion. It blasted everywhere. Then immediately used club soda on the sofa, blotted until it came out. The stain from the disaster remained. Then, one of my friends told me to pour some salt and let it sit. As salt absorbs the wine and pulls it out of the rug fibers so I dumped every single ounce of salt available in the house on the rug. I was totally confused about what should be done? Started thinking if the tips given by a friend is appropriate or not. Then I decided to apply some best area rug cleaning tips by My Cleaners. Then without getting confused, I looked up and decided what should be done appropriately. Here is the best and most common combination of steps by My Cleaner experts. This will help you deal with the situation if it happens again in the future. Pour some white wine over the red wine stain. White wine is great at neutralizing the red wine which makes the red wine easier to lift off your area rug. Some people prefer water or club soda, but white wine is the best and recommended by the experts. Then, gently blot up the excess liquid. Sprinkle around 1/4″ thick layer of salt over the spill. Be generous with the stain. If the 1/4″ of salt is wet, I would suggest you to pour more. Leave the sprinkled salt for a night or until it gets completely dry. In my case, some parts turned into a peanut brittle type substance. Remove salt from carpet by scooping up hard, dry pieces and then vacuuming. If you are going with your call, then follow your manufacturer instructions. The moral of the story is you should be aware of the steps to be taken when performing stain removal for your rugs. If you are not confident then you can call My Cleaner. We can clean your rugs on behalf of you. We provide best Area Rug Cleaning in Cape Coral, Fort Myers FL, Naples FL. Call us at (239) 333-5655.